The next couple of days will be crucial for the future of Hellenism in the United States. A decision will be taken in Istanbul on whether Archbishop Demetrios of America will step down from his post and, if so, who will replace him. Officials in Athens would in the past treat this as a routine decision. But this is no longer the case. The Greek Orthodox Archdiocese of America is facing an unprecedented crisis that calls for immediate and radical solutions. Financial mismanagement in the construction of the Saint Nicholas National Shrine at the World Trade Center has shaken the confidence of leading members of the Greek-American community in the Church leadership. No one really understands how and why such large amounts of money went missing. At the same time – and this is more important – the organic relationship of Greek Americans with the Church and Hellenism is quickly fading away. This can, to a considerable extent, be attributed to mixed marriages and the passage of time. The Church has grown old as an institution. Archbishop Iakovos was the last dynamic and charismatic leader. He might have indulged in his own power games, but he had the ability to energize the community like no one else could. He had very good access and could inspire among leading Greek Americans the desire and the vision to achieve things as a community. The Phanar never really wanted to replace Iakovos with as dynamic a personality – perhaps out of insecurity or because the reservoir of talent, as it were, had run low. But there can be no Phanar without the United States, in every sense. The patriarch’s decision on the issue is long overdue. Frustration among the diaspora is growing and calls for an autocephalous church are intensifying. 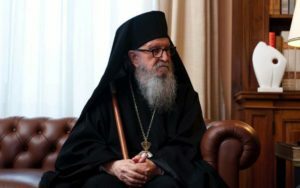 If no decision is made at the Holy Synod of the Ecumenical Patriarchate, or if a half-baked solution is reached, the consequences could be disastrous. The patriarch is aware of the historic significance and he has the judgment and the courage to take decisions which will bring a very regrettable issue to an end. Sure, it is important who he will pick as a successor to Demetrios, if he eventually decides to remove him. Historical circumstance mandates the selection of a religious leader with leadership qualities, good communication skills and who is compatible with the needs of the community. The Greek diaspora in the US cannot endure another mistake, or to be faced with an option dictated by neo-Byzantine balancing acts and conflicts of egos. It’s time for an American born archbishop who puts Orthodoxy above Hellenism in the GOA. And why should Athens have any role in my American GOA? Because your religion isn’t Orthodoxy, it’s Hellenism, from Socrates to Souvlakia. Got that? It’s more important to protect Greek foreign policy aims from Athens than it is to spread the Gospel. If I’m not mistaken, Archbishop Spiridon was an American born prelate who was educated in American public schools and was an advocate of Hellenism. As you may recall, his brief term as Archbishop of the GOA created disorder and disruption following the Patriarch’s removal of the late Archbishop Iakovos. Fortunately, the GOA’s national reputation was rescued with the appointment of the learned and astute Archbishop Demetrios who replaced him just prior to the 9-11-2001 disaster. Peter, agreed.By the way, promotion of Hellenism is not a bad thing just not the function of the Body of Christ.